The noise absorbing lining inside the turbine of the BL 450 E assists in dampening vibration and reducing noise levels. Since the turbine is mounted at an angle, the airflow always pushes the dislodged leaves forwards. This enables you to control the impact of the airflow. Hence the increased efficiency : The leaves never fall back on to the cleared space. Clearing away leaves in the autumn is extremely important. For example, leaves can block drains or cause traffic problems. You must therefore have reliable machines at your disposal in order to guarantee the safety of everybody. ELIET took this requirement seriously and constructed a reliable blower that you can continuously deploy during the entire autumn. Air displacement is produced by a large fan impeller. This impeller is manufactured from light aluminium. As this impeller is light, hardly any inertia forces are experienced on the machine. The engine, furthermore, has no difficulty in maintaining a constant speed, thus resulting in low fuel consumption. This fan is accurately balanced to within one gram using a special measuring bench at the factory. This eliminates any imbalance that could cause vibrations. When the air leaves the blower nozzle, the airflow diverges. The leaves that are blown away are transported in this airflow. 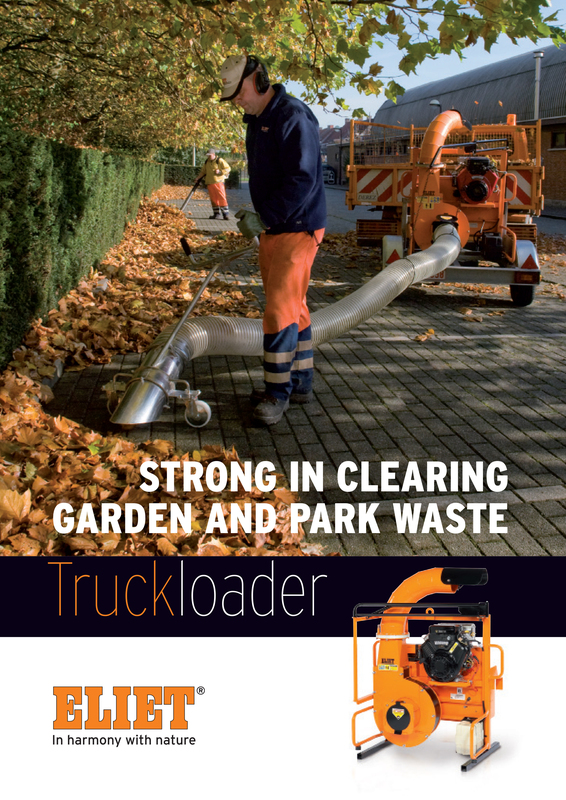 In a conventional leaf blower, some of the leaves always end up behind the machine and fall onto the path that has just been cleared of leaves. However, the advanced design of the ELIET BL 450 E takes this into account. The angled position of the turbine ensures that the leaves are always blown forwards at an angle. This enables the operator to have more control over the cloud of leaves that are blown upwards, and to be able to accurately determine where they will fall. It is essential to be able to accurately direct the generated air jet in order to efficiently clear away the leaves. ELIET have therefore developed a blower nozzle that provides the operator with a great deal of freedom. If the operator decides to direct the air jet laterally, he can use a small handlebar mounted lever to either direct the jet of air nearby in order to blow away sticking leaves, or to direct the jet of air further away in order to allow the leaves to be carried along with the air jet. The ELIET BL 450 catches your eye because it has a long handlebar. This choice was made by the designers after careful consideration. Thanks to this long lever, the operator can easily tip the machine in order to drive over obstacles (such as kerbs, tree roots, etc.). Moreover, the machine must be extremely manoeuvrable in order to quickly direct the air stream from the turbine. This long handlebar thus enables the operator to permanently change the direction of travel with a minimum of effort. The handlebar is fixed to the frame on vibration isolators. The vibration free handlebar is certainly not an unnecessary luxury when you bear in mind that operators often use this machine all day long. Moreover, the height of the handlebar can also be adjusted so that the operator can find the most ergonomic working posture for his build. In addition to the noise from the engine, noise is also generated by the interaction between the impeller and the swirling air. A noise-absorbing rubber armor has therefore been fitted around the casing in order to minimize the noise generated by the turbine housing. Unlike other blowers, the multifunctional blower nozzle on this ELIET blow machine is unique. This recent development has enabled the lateral direction of blowing to be quickly switched to a forward direction. With the forward direction of blow selected, the airflow is divided so that part of it is diverted to clear a lane the same width as the machine at the front right. The two air deflectors in the lateral air duct can be adjusted with a lever on the handlebar. This lever enables you to easily adjust the direction of the airflow in order to dislodge and blow away leaves.